Few things add timeless elegance and value to a home like new bay windows, but even the best bay windows are an important decision. To make sure you are getting the best window style for you, Improveit Home Remodeling has some useful insight to offer. As a leading replacement window company, it’s our job to provide each customer with the right style for their needs and budget. If you’re on the fence about new bay windows or bay window replacement, we might be able to help by giving you some pros and cons to consider! 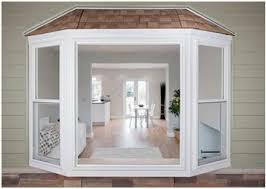 OPEN SPACE: Bay windows expand outward, creating more space inside your home. There are a variety of ways to use this space, like creating a cozy reading nook. DESIGN VERSATILITY: Show off your unique style with shelving underneath the window, plants, pillows—get creative! CURB APPEAL: Okay, so, it’s worth mentioning again. Few window designs add value—and most importantly—curb appeal like a bay window. Potential buyers will take notice! NATURAL LIGHT: Adding light to your space sets a brighter mood, and more windows means more light! You also get a better view of the outdoors. ADDED VENTILATION: Bay windows come with two side windows that can open to let in some fresh air. ENERGY-EFFICIENCY: When you get quality bay windows, like those offered by Improveit Home Remodeling, you get energy-efficient windows that keep your home comfortable year-round and reduce energy consumption. Structural issues that lead to costly repairs. Low-quality products that cause drafts and low energy-performance. Even if you are the DIY type, hiring expert window installers is the best option. That way, you know you’re getting a top product and seamless installation for lasting performance and style! If you’re looking for Columbus replacement windows that provide the quality you need complete with the superior service you deserve, go with Improvit Home Remodeling. We offer fast, reliable service for a mess-free installation that lasts, all at a competitive price, starting with a free in-home consultation! ← Ready to Remodel Your Basement?